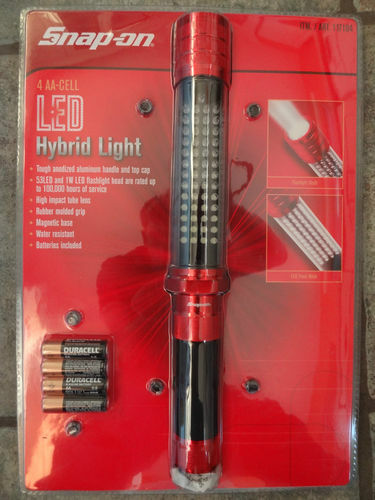 After last weekends performance with the religious order stalking me in my garage I decided that not only did I almost break my teeth, but I also need a good torch. Many hours were spent on the net looking around for something I liked the look of. A month or so ago I was in the Snap On van and spotted a Blue Point model, it wasn’t brilliant looking but I figured it would do the job. As per normal I got home and looked for it on eBay. While I was looking at other torches of a similar style I spotted a Snap On torch (this model in fact). The Halfrauds model I got is rubbish and hardly lights up much at all. So I took the plunge. This was a blow moulded plastic cover, you know one of them annoying plastic ones that manage to cut you no matter how careful you are. Inside the wrapping was the torch itself and set of four Duracell AA batteries. The instruction guide was a little folded up piece of A5 at the bottom. The torch is very lightweight and comes in 3 parts. The lighted end, the grip and the bottom where the magnet sits. (More on that later). Unscrew the bottom and the and there is a black cartridge type idea that comes out. Load the four batteries and that part is done. You will notice that there is like a key way cut out on one side, this is to make sure the battery pack can only go in one way for the contacts. In the pictures below I have also unscrewed the handle to expose the contacts as well. You can we the extra location lug for the battery pack as well. Once it is all back together the feel is still light and has a good feel in the hand. There is only one button that will cycle through the modes. Press once – Tube array, press again for the single end torch and a third time for Off. That’s it. The top part around the top is a nice red aluminium and the tube cover is a strong plastic cover that should be able to take a few knocks. The handle is again aluminium construction and has a rubber grip all round. The bottom cap is aluminium to match the rest and has a magnet in the base. The tube array was much brighter than I expected, I’m not quite sure what I was going to get but it is bright. The light seems to go to a directed wide strip of light without going sideways. How it does that I can’t say but it’s clever. The main torch is a single LED that is super bright, in fact it goes a good hundred feet or so in the back garden. This is a fixed beam and stays in focus up to that distance, after that the beam will disburse. But as I am using it in the garage, not at Heathrow airport to land a Boeing 747 that doesn’t matter. Now then, the magnet; I was sceptical that the magnet was nothing more than to stop it moving. So I tried a few places and it stayed put. I stuck it upside down, I stuck it 45deg, and I stuck it horizontal and it held. It didn’t slide down, it didn’t move at all. I was impressed to be fair. As I was working on the drum brakes, it was stuck it to the chassis to see behind the backing plate. Brilliant until I sort of knocked it a little and then it fell off, hit the floor and marked the top rim of aluminium. It didn’t dent it and it looks fine, apart from the parts were the stone has taken the paint of. The fact it fell of was my fault and could be expected to in all honesty, but a slightly bigger or stronger magnet might have held it firmer in place. A strap and slightly bigger magnet would have got this higher marks. Shame the paint (anodizing) isn’t a little better. I fully agree for a cheap price its a great torch. But high money you would expect that little bit more. I’m certainly pleased I have it that’s for sure.